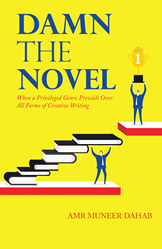 “Damn the Novel: When a Privileged Genre Prevails Over All Forms of Creative Writing” by Amr Muneer Dahab serves as work of literary criticism that refutes the belief that the novel and narrative fiction are the kings of the literary world. An exciting reading experience, the book takes readers on a journey to appreciate and embrace all literary genres equally with greater freedom. As a journalist with extensive knowledge of the Arab literary tradition and other topics relevant to the international cultures, Dahab presents a defense of all literary forms and the unique merits of each. “If the Era of the Novel were not an expression of underestimation toward the other literary genres, I would take the lead in supporting a definition of our time anchored in literature,” said Dahab. “In fact, literature has been resisting marginalization so audaciously that it merits homage for staying alive."